Angered by China's hard line against democracy in Hong Kong, tens of thousands of people waved candles, sang and chanted Friday to commemorate the 15th anniversary of the bloody Tiananmen Square crackdown in Beijing. Vowing to fight on for universal suffrage in China and Hong Kong, the massive crowd bowed three times -- a Chinese funeral tradition -- in the direction of a monument dedicated to those killed in the June 4, 1989, military assault. "Democracy's heroes stand forever," it read. 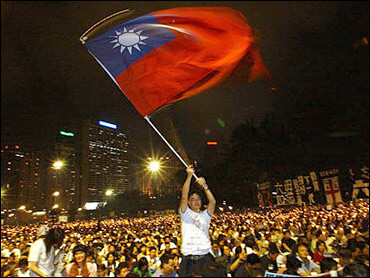 "May your spirits be with us as we continue the fight," opposition lawmaker Szeto Wah said. People young and old sang and chanted at the annual commemoration that was highly charged this year after Beijing told Hong Kong citizens in April they cannot directly elect their next leader in 2007 or all lawmakers in 2008. Organizers claimed a turnout of 82,000, but police said the crowd had peaked at 48,000. Holding up thousands of candles, the demonstrators created a sea of flickering lights that spread across a sprawling park that took on the appearance of a big outdoor rock concert. With its free speech rights, Hong Kong is the only place in China where such demonstrations are held. But many in Hong Kong say they are locked in the same struggle as the student activists who died in Beijing 15 years ago. "Hong Kong should be democratic," said university student Rocker Tsui. "Hong Kong people should be ruling Hong Kong ourselves." The 1989 crackdown gave Hong Kong a political awakening, and its memories still resonate. Locals were stunned and outraged to see their motherland turn troops on unarmed students. Hundreds if not thousands of people were killed, and 1 million people spontaneously took to the streets of Hong Kong in protest. At the time, Hong Kong was just eight years away from being handed back to China by Britain, and the Tiananmen Square events stirred mistrust on both sides. Beijing feared the protests in Hong Kong were an indication the freewheeling territory it was about to inherit could become a base for subversion. The Chinese government says its troops were needed in June 1989 to break up a counterrevolutionary riot but Hong Kongers believe the real intent was stopping any challenges to its one-party rule. In Beijing on Friday, police kept tight control over Tiananmen Square, detaining at least 16 people to ensure there was no public expression of dissent. Extra guards were deployed around the square, and an Associated Press photographer was briefly stopped after taking pictures of detentions. Chinese tourists were forced to delete photos from their digital cameras. Bitter memories linger in Hong Kong, along with admiration for the slain students. "The people's republic should be for the people, not for killing the people," said a woman who identified herself only by the surname Pau. The commemoration always attracts tens of thousands of people in Victoria Park - a legacy of the colonial past complete with a seated statue of Queen Victoria. Many demonstrators criticized Hong Kong's highly unpopular leader, Chief Executive Tung Chee-hwa, who took control when the British left and is seen by many here as a puppet of Beijing. "He doesn't know how to deal with political problems or the economy -- I wish we had a choice," said teacher Pat Sy. "Democracy is good for people. It's more important than the economy." Although critics charge China stripped away Hong Kong's guaranteed autonomy, Beijing has stressed economic growth for the territory in hopes that will mute the demands for universal suffrage. Politics in Hong Kong have grown more turbulent since July 1, 2003, when 500,000 people marched against an anti-subversion bill they viewed as a threat to freedoms and Tung had to withdraw it. Emboldened by the success of the "people power" movement, many began clamoring for universal suffrage. Beijing ruled in April it won't happen any time soon. Tung was chosen by an 800-member committee loyal to Beijing. While ordinary Hong Kong citizens can elect 30 of 60 lawmakers in September elections the rest will be chosen by special interest groups, such as business leaders, who tend to side with Beijing and Tung. Many in Hong Kong feel a duty to speak out for Chinese democracy, because they enjoy free speech rights -- unheard of in the authoritarian mainland - under a government arrangement dubbed "one country, two systems" put in place at the handover. "We have to tell Beijing what we want to say," said 68-year-old retiree Kwun Ken. "If they don't like to hear it, we have to say it again. It's a basic human right."